This Walnut grille covers an unsightly in-wall HVAC unit. It has a hinged section that swings open for access to the controls and the entire grille is easily removable for service access. 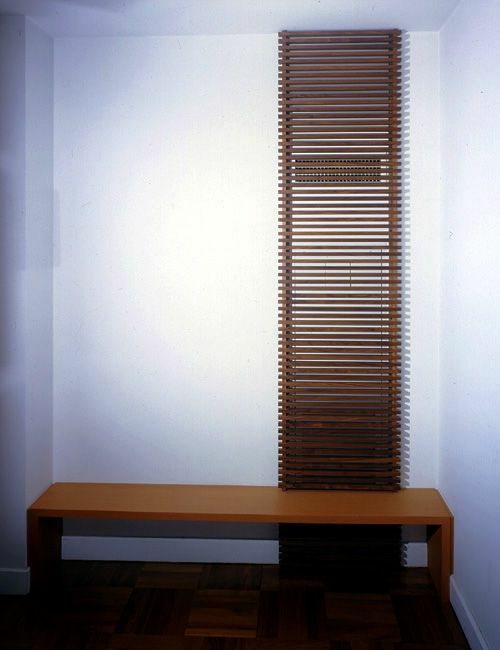 The grille intersects the Fir bench, which the client wanted as a place to change his shoes. The entire composition occupies a niche in the home's entry hall. Dimensions: Grille: 3" x 19" x 106"
Bench" 14" x 16" x 79"